(1) Duplex Metering Pump skid & spill containment. (1) Online PAA residual monitor. 5 year chemical and equipment supply agreement. 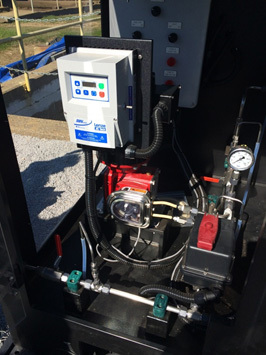 The city of Morganfield, KY identified their chlorine gas disinfection system as a cause for concern and began considering alternatives in early 2014. In October of 2014 they began a 3 month pilot to establish PAA as a cost effective solution and collect the data required for the KY DOW to remove chlor/de-chlor from Morganfield’s NDPES permit. The pilot ran through the winter as shown in the pictures. Due to the low freezing point of PAA and its resistance to UV degradation a building is not required. Morganfield staff determined their effective dosage of VigorOX WWTII peracetic acid to be 1.2-1.5 mg/l. After the 3 month trial was completed the results were submitted to the state for permit modification. In early 2015 Morganfield received their new permit with PAA disinfection. Morganfield decided to move forward with a 5 year supply agreement with PeroxyChem. PeroxyChem would guarantee the cost per pound of peracetic acid for the life of the agreement and supply all the required equipment to safely and accurately meter the chemical. Morganfield chose a 5 year agreement over a shorter agreement to keep the cost per pound as low as possible. 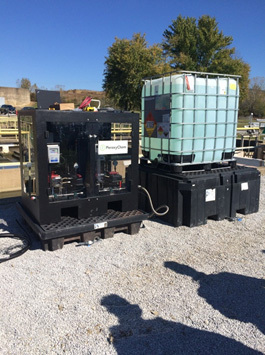 PeroxyChem’s complete system solution provided Morganfield a safer, more environmentally friendly, disinfection system while requiring no capital expenditure from the city of Morganfield.